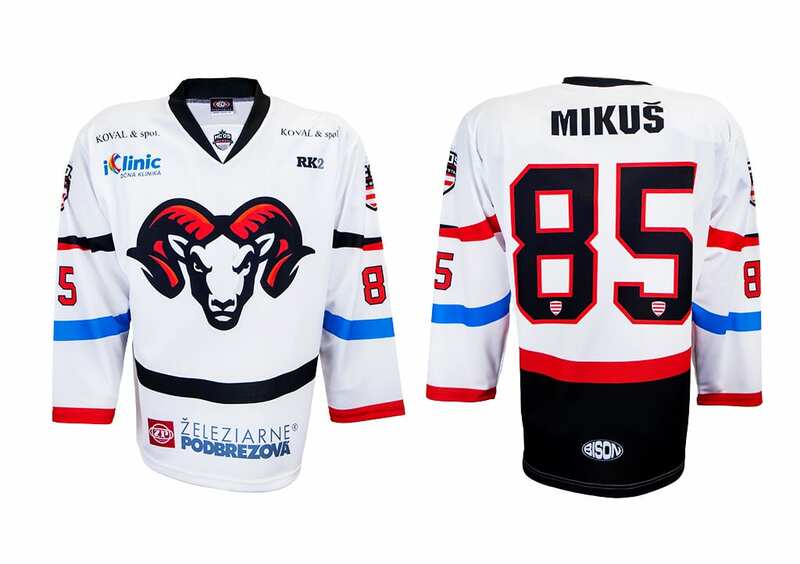 Ice hockey jerseys, pants, socks | Bison Sportswear. Sharp blades on the legs, armor on body, black rubber puck, two goals and ice, those are companions who are constantly encounter in a hockey game. Hockey is a challenging game that requires speed, skillfulness and sometimes even hardness. The players, but also their jerseys, are heavily exposed to load by their mutual contacts or by falls on ice torn from skates. 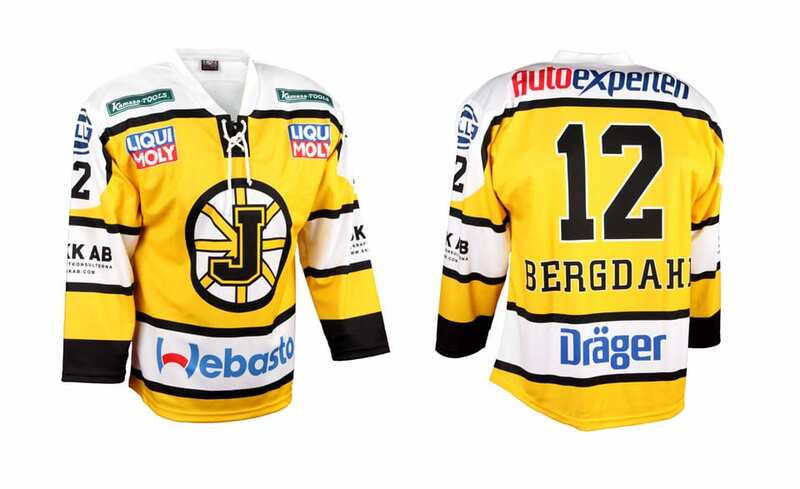 The ice hockey jerseys must be durable, but also comfortable and functional. We offer you such jerseys. 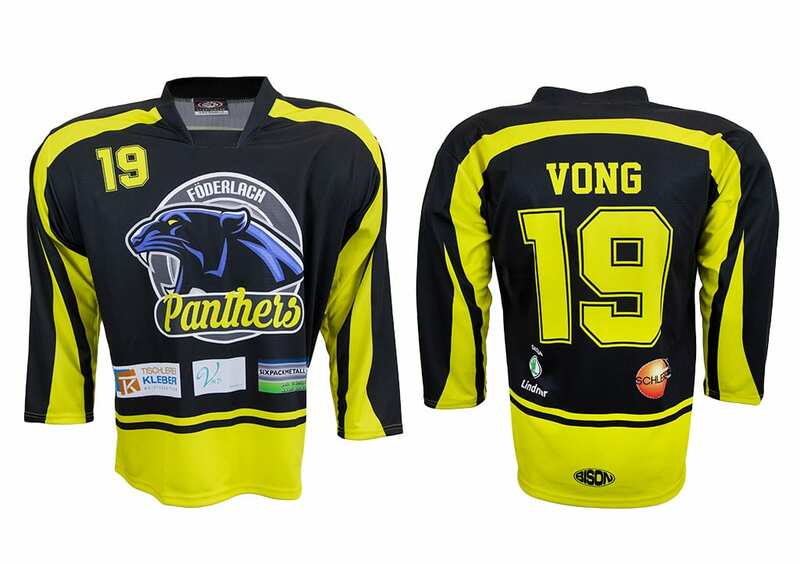 Jersey for hoceky is made in several patterns, namely Classic, Round Yoke, Rectangular Yoke, Raglan, Raglan – Round Yoke. All patterns can be further adjusted. It is possible to carry out the adjustment in the form of double sleeves or shoulders, sewing ventilation and mini-ventilation mesh into the side part of the jersey and the like. We adjust color of the meshes as one of the few manufacturers in order to achieve perfect resulting jersey design. Naturally, you can choose the type of collar, fonts and numbers according to your wishes. We also have an option to choose lower finish of the jersey in the STANDARD or PRO style. The basic size jerseys can be determined using the size tables. The best materials of jerseys are: CANADA 230 gr., Sun 230 gr., Blesk 230 gr and Elite 230 gr. Canada 230 gr. is the most widely used, professional and high quality knitwear ensuring the high quality and durability. Sun 230 gr. is a high-quality polyester knitwear, which is now very sought-after item for its smooth texture, which makes all the logos and designs stand out. Blesk 230gr. is a porous polyester very glossy material that gives the jersey a glittering effect. Elite 230gr. is a polyester material with patterns specifically designed to the materials used in the NHL. It creates the impression of a cube design to highlight the effect of the highest quality of the jersey. More information about materials can be found here. Informace o ceně naleznete v price list. We produce hockey socks from a strong polyester knitwear Filet 350gr. This material is very elastic and perfectly surrounds your body. More detailed information about materials can be found here. Information on the price can be found in the price list. While maintaining all the requirements for the necessary functionality, we offer the possibility of own, original design on hockey underwear. You can have them in any club colors, with a logo of the club, the sponsors or with the name for each player. We will prepare your own design of your hockey underwear in our graphic studio for free! The used material (polypropylene) is very pleasant to the body, extremely light and flexible with elastic elongation in all directions. It maintains the necessary micro-climate and thermal comfort during exercise (load). 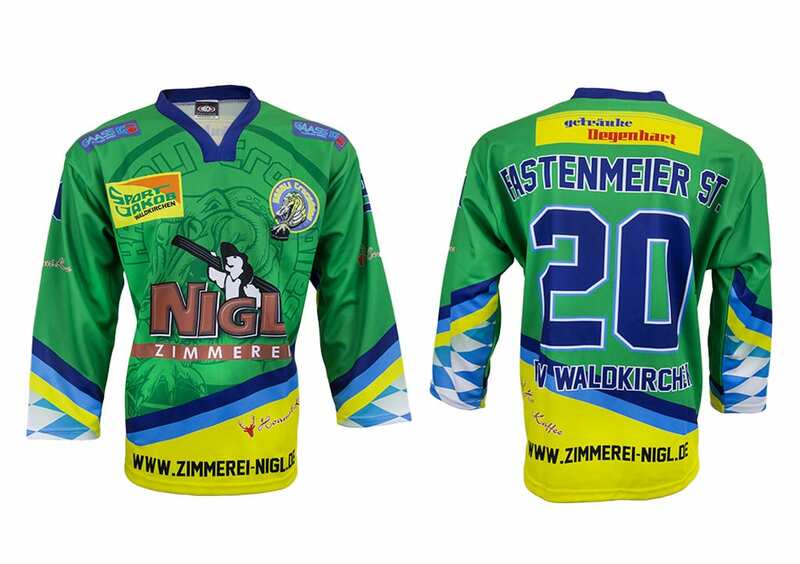 It was developed and tested specifically for the possibility of sublimation printing on hockey underwear and is one of the Hi-tech fabrics. High-quality processing and flat design of seams for greater comfort is a matter of course. We offer variants with long and short sleeves, as well as long and short pants. We offer three printing options: Classic, which prints on the sleeves and collars and sideseam in case of pants. Standard provides a print on sleeves, collar and the front part of the body. In the case of pants, there is again a sideseam. The Pro print variant ensures prints on the entire set, including the rear part. In the case of pants, there is again a sideseam. We present you a top professional hockey leg warmer made of strong polyester knitwear, namely Filet 350gr. The material is highly elastic and perfectly surrounds the pants. More detailed information about materials can be found here. The advantage is the possibility to match the design of the jersey, the leg warmers and the socks in the form of a uniform design set. The result is a professional look of the leg warmers, a well-fitting on the ice hockey pants. The size can be determined using our size tables. Information on the price can be found in the price list. Bison has prepared an offer of single-color hockey jerseys for you in the above-mentioned variants. We supply these jerseys without the possibility of printing. More detailed information about materials can be found here. Information on the price can be found in the price list. Bison has prepared jerseys for hockey referees for you. We will be glad to supply you with Profi and Standard jerseys. This is a very popular jersey, which thanks to the material, specifically designed for jerseys of referees (100% polyester Drom, 280gr. ), is not creasing and retains its shape. The jersey is washable without loss of the colors. Silk black collar with a long zipper makes it easy to put on and take off the jersey. According to the order, we supply Assistant and Main Referee (imprinted orange tapes) jerseys. Profi category jerseys have an inner sleeve part completed with black mesh for perfect air circulation. The basic jerseys size can be determined using size tables. More information about materials can be found here. Information on the price can be found in the price list.